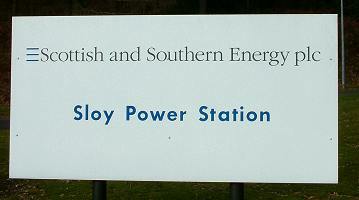 The UK's largest conventional hydroelectric power station, Sloy Power Station, is located on the bonnie banks of Loch Lomond, near Inveruglas. It takes water from Loch Sloy through four large diameter pipes down the mountainside giving a working height of 277 metres. Loch Sloy is dammed to retain the water and is fed by a series of tunnels and aqueducts from a much larger area. 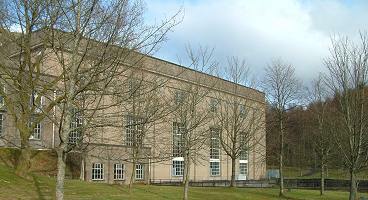 The original Power Station was opened in 1950 by the Queen Mother and was designed to provide power to Clydeside and Central Scotland at times of peak demand. Full load can be achieved within five minutes. The station was refurbished in the late 1990s at a cost of £113 million and reopened in 1999 by Sarah Boyack, then Minister for the Environment in the Scottish Government. It can now produce 160 MW power. 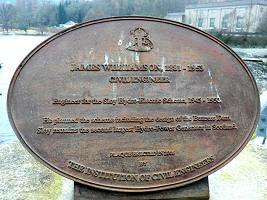 A plaque was erected in 2006 near the Inveruglas Visitor Centre, facing the Power Station. 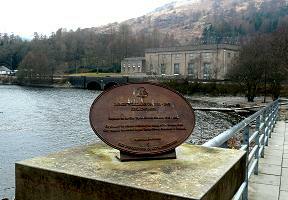 The plaque outside the Inveruglas Visitor Centre - the power station can be seen behind. Click on the right-hand image for a larger version of the plaque. He planned the scheme including the design of the Buttress Dam. 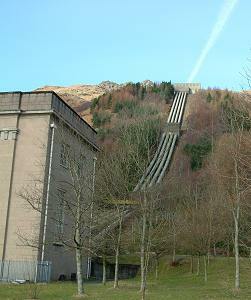 Sloy remains the second largest Hydro-Power Generator in Scotland. 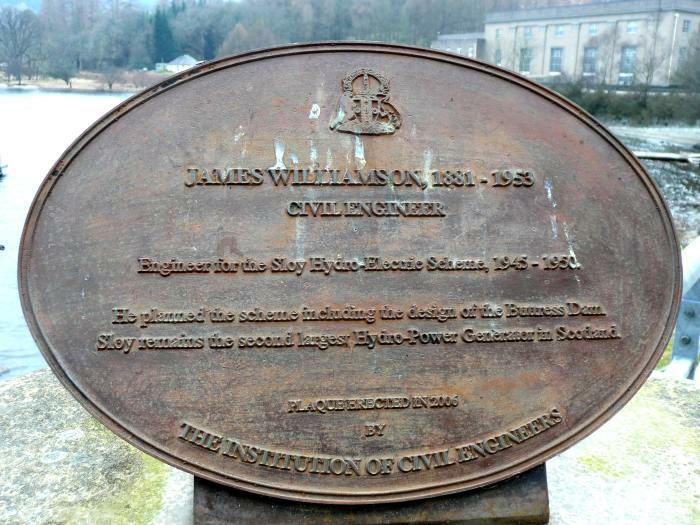 Plaque erected in 2006 by the Institution of Civil Engineers. Most of the pictures on this page were taken in February 2005. The photographs of the plaque were taken on a dull day in March 2010. It is no longer possible to photograph the outlet basin from the road as shown in the picture below, as a large platform has been built over the basin. This also obscures the lower windows. Page Updated: 10th March 2010.